LADY LAKE, Fla., Oct. 6, 2011 (SEND2PRESS NEWSWIRE) — Tickets starting at $35 are still available to see award-winning country-music mother and daughter legends Naomi and Wynonna Judd take their final Central Florida bow on the Last Encore Tour, October 15, as they headline The Grand Oaks Festival featuring The Judds, according to Alliance Healthcare Foundation President Ted Williams. Gates will open at 10 a.m. for the music festival, which will benefit the non-profit Foundation which provides philanthropic support to Leesburg Regional Medical Center and The Villages Health System. 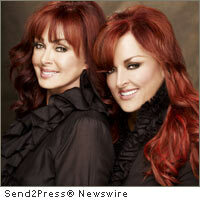 The Judds are scheduled to appear at 3 p.m. at the 400-acre Grand Oaks Resort located midway between Orlando and Ocala and just eight miles from The Villages. Opening acts include The Calhouns, McKinley and Beggs, Rob Nichols, Norman Lee, and Donna Moore. General seating tickets are $35. Preferred and VIP seating are available $60 and $125. All major credit cards are accepted. For directions to the resort, visit http://www.TheGrandOaks.com . Tickets are also available through http://www.ticketmaster.com or by calling 1-800-745-3000. Alliance Healthcare Foundation (cfhalliance.org/giving_overview.htm) is a not-for-profit Foundation which provides philanthropic support for Leesburg Regional Medical Center and The Villages Health System in Central Florida. The Foundation’s mission is to provide a margin of excellence for quality healthcare in the communities served by these hospitals through fundraising, friend-raising, leadership and donor engagement. Original Keywords: Florida, The Calhouns, McKinley and Beggs, Rob Nichols, Norman Lee, and Donna Moore, The Judds, benefit concert, Alliance Healthcare Foundation, Naomi and Wynonna, Last Encore Tour, fundraiser, The Grand Oaks Festival featuring The Judds, philanthropic support to Leesburg Regional Medical Center and The Villages Health System Alliance Healthcare Foundation Lady Lake Florida LADY LAKE, Fla.
REFERENCES: Entertainment News, Florida, The Calhouns, McKinley and Beggs, Rob Nichols, Norman Lee, and Donna Moore, The Judds, benefit concert, Alliance Healthcare Foundation, Naomi and Wynonna, Last Encore Tour, fundraiser, The Grand Oaks Festival featuring The Judds, philanthropic support to Leesburg Regional Medical Center and The Villages Health System Alliance Healthcare Foundation Lady Lake Florida LADY LAKE, Fla.